In the tradition of the KFC Double Down and other infamous meals, Taco Bell has released the Doritos Locos Tacos, a taco supreme wrapped in a Doritos Nacho Cheesier corn chip shell. Weird naming issues aside (“tacos” is used a the singular form here? ), it’s an interesting concept, and the combination of two heavyweight junk foods has promise, at least from a novelty standpoint. But does it deliver? Barely. Really, the problem with this thing is that it’s not over the top enough. The taco supreme base is standard ground beef with lettuce, tomatoes, sour cream and cheese. There’s nothing there that’s super interesting. 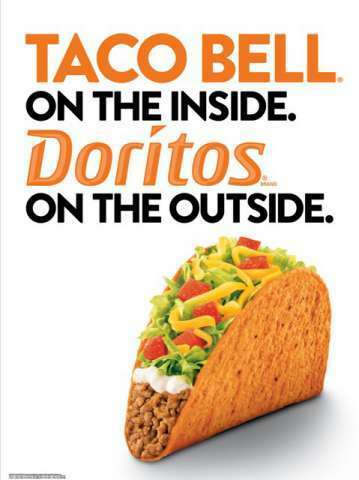 The shell is alright, but the Nacho flavoring isn’t strong enough to make it worthwhile. The combination of Doritos and sour cream is a start, but there needs to be another sauce or something. Again, it’s not so much that it’s bad, it’s just not very different from a normal hard-shelled ground beef taco. The Doritos Locos Tacos is about $2 and can be bought as part of a $5 box meal. It’s worth checking out once if you’re curious, and more times if your happen to really like taco supremes. Outside of the novelty though, there’s not much to recommend for this one, so don’t feel bad if you miss it. I do hope they go back to the drawing board on this one, I’d like to try a more innovative take on it.